Go to the Fortinet support site and log in. Navigate to Download > VM Images. Under Select Product, select FortiGate. Under Select Platform, select Google. Download the deployment package file. 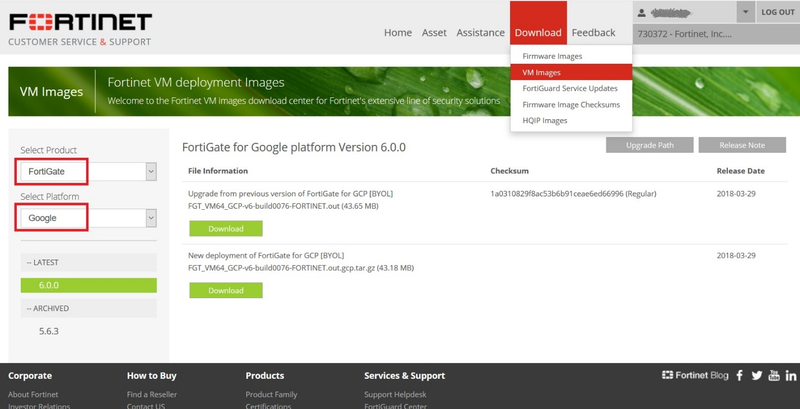 The deployment package file is named "FGT_VM64_GCP-vX-buildXXXX-FORTINET.out.gcp.tar.gz", where vX is the major version number and XXXX is the build number. This deployment method is only applicable for BYOL. The PAYG deployment file will be ready at a later time.